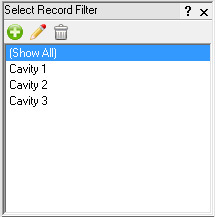 Record Filtering is a powerful feature that helps you narrow down the records on screen before sending your data to Minitab Statistical Reports. The SPC Office Buddy's advanced English based SQL-Like filtering screen allows you to create custom filters to display only the information that is most important to you. Add, Edit, and Delete your custom filters all in one screen. Set up filters using AND or OR logic and group your statements with parentheses. Choose from a full list of comparison operators including =, >=, >, <, <=, LIKE and BETWEEN. Add "Is Not" to any query to negate the operators. Specify the maximum rows you want to return to limit your results. The Buddy's powerful query engine will stop searching automatically after it reaches your maximum.